What is a real Los Angeles tour? Our guests are interested, curious people, who want to have an authentic experience of Los Angeles. That’s why our tours are based around walking, cycling and the L.A. Metro – because it’s the best way to see and learn about the city. Since we started our Los Angeles tours in 2013 more than 10,000 guests, from over 100 countries, have joined us and we’ve been awarded TripAdvisor Certificates of Excellence every year. The LA in a Day tour: We’re pioneers of the all day metro and walking tour of Los Angeles. It starts in Hollywood, then we jump on the Red Line to DTLA (which is perfect for lunch), before finishing the tour in beautiful Santa Monica. The Real Hollywood Tour: Many visitors do a Hollywood tour, usually packed in a crowded minivan, but they don’t see or learn much. We’ll show you the area’s fascinating history and hidden corners, so you truly discover the myth and the place. The Central Downtown LA tour: Downtown is the oldest part of the city, with some of its most beautiful architecture. We were the first tour company to offer daily tours of this historic neighborhood, where the city was founded in 1781. 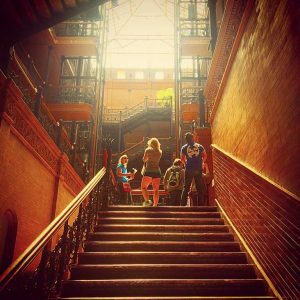 DTLA Murder Mystery Ghost tour: DTLA has some incredibly horrible history, from infamous unsolved murders to being home to no less than four serial killers. We go on a noir investigation. You can combine The Real Hollywood Tour and the Central Downtown LA tour to create a special six hour tour of Los Angeles, with all your Metro travel included. We have four other unique experiences: the Santa Monica and Venice Bike tour and, available to book as private tours, the Mount Hollywood Hike, the LA: Wild West to Now tour and two LAX Layover tours. To open in Google maps click the icon in the top right corner. We have Los Angeles tours for all budgets: free self guided tours, group tours from just $30 pp & private tours from just $180 per group. Our expert guides create entertaining & engaging tours, which will transform your understanding & appreciation of L.A.
We get off the beaten track to reveal the hidden beauty of Los Angeles, making your visit a truly memorable & enjoyable experience. CLICK HERE TO LEARN MORE ABOUT OUR TOURS! The inspiration for The Real Los Angeles Tours came when I visited Europe in 2012 and discovered a guided walking tour. In the past I would wander the streets with a guidebook, but I realized that a walking tour is a much better way get to know a city. I got a quick history lesson, saw most of the best sights and was able to ask all the important questions I had (like where to have lunch) from a local expert. It was the highlight of my trip and I began doing walking tours in every new city I visited. I looked for a tour of L.A. like that when I returned, but all I saw were bus tours of Beverly Hills mansions (most of which never had a star living in them) and Rodeo Drive, which is a tiny part of Los Angeles. So, as an Angeleno who loves to travel and loves my home city, I felt compelled to start a company, offering visitors totally different tours, that would reveal a much more interesting side of the city. I was also excited to create eco-friendly tours, which I could use to raise money for environmental causes. We started in 2013 with one tour of downtown, the LA: Wild West to Now tour, and I was the only guide. Since then we’ve grown a lot – we now have eight tours, covering different parts of Los Angeles, and five guides. In all that time, though, one thing has never changed: our mission, which is to give our guests a genuine and entertaining experience of the real Los Angeles. Let us be the highlight of your trip. I was raised trilingual (English, Danish and German) in Denmark, leaving when I was just 19 years old, curious to discover the world and wanting to build multicultural bridges. My first destination was Los Angeles and I spent five super fun years here, before leaving on more globetrotting adventures. I lived in Australia, Singapore and several European countries, but the lure of L.A. drew me back in 2011 and now I'm finally ready to hang up my boots. I'm always eager to share my passion for the secret spots of the city I love and call home. I've done many things in my time, including being a stand-up comedian, a musician and a financial advisor, but one thing I've always loved to do in my time off is travel. I've visited every US state and over 25 countries. My last big trip was a month in New Zealand. What do my vacations have in common? Well, I've taken a tour in almost every place I've been. I strongly feel that experiencing a city on a guided walking tour, with someone who has a passion for it, is the best ways to connect with the heart of that place and its people. I'm from the UK and I majored in History at the University of London. Travel has always been one of my biggest passions and I lived in Germany, Spain and Australia, before moving to L.A. in 2008. Since then I really feel like Los Angeles has become my home. I love its dynamism and multiculturalism, the many cultural offerings it has, the friendly nature of most people here and, of course, the weather. In many ways the reason for founding The Real Los Angeles Tours was to give visitors the chance to fall in love with L.A. like I did. Hi! Like many people you meet here I'm a transplant, moving to L.A. from the great state of Iowa in 2015. I got the travel bug when I was 19 years old, traveling to Italy with my best friend. Since that first excursion I've returned to Europe twice and backpacked around most of the continent, in addition to traveling extensively around the United States, Central and South America. Next on my list is Asia and Japan. I enjoy sharing my passion for travel and my love for Los Angeles with all who come on my tours. One thing I really love about L.A. is the sheer variety of its various neighborhoods. I live in DTLA in an old hotel that's been converted into apartments, so I'm always reminded of the city's fascinating history. That's made me passionate about uncovering its hidden treasures; two areas of particular interest are gangsters and the Golden Age of Hollywood - which have more in common than you may think! I moved here from the UK, where I was a successful composer, in 2013, but my heart now belongs to the city of angels.